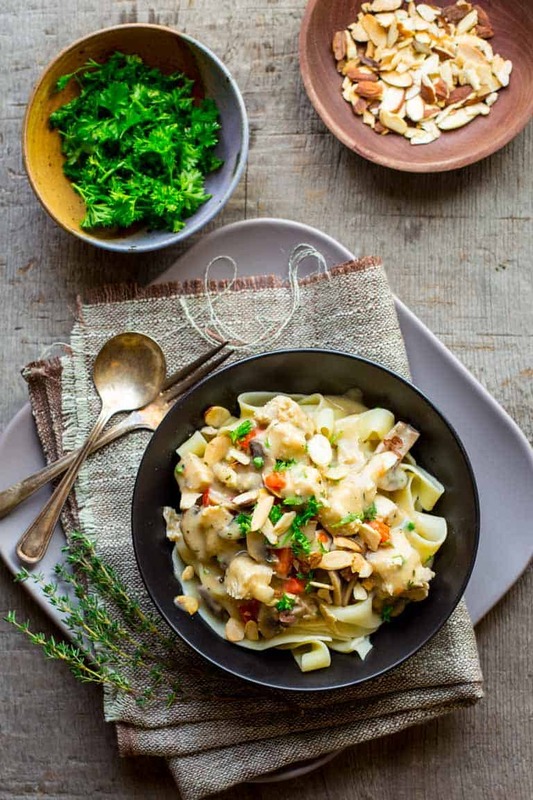 This creamy chicken a la king is a healthy makeover of the classic comfort food dish. This chicken a la king is loaded with fresh vegetables and only a splash of half-and-half. So that it can come together quickly for a weeknight meal in just a half hour, I skipped the fussy puff-pastry in favor of steaming hot pasta. I originally shared this recipe on September 16th, 2016. I have re-processed the images and updated some of the text today. When we renovated our kitchen last spring, I had to put all of my cookbooks into boxes and store them while the dust flew. When it was time to reload my cookbook shelf with my favorites (the less used ones go in the book shelf in the hallway), I realized it was time to part with some of the ones I had been holding onto for years but still didn’t use. Buh bye, freebie carrot cookbook that I will never in a million years use, or the un-named vegetable book from the ‘90s that disappointed me over and over. I sold them in a flash at our garage sale early in the summer, and now they are in someone else’s kitchen, hopefully getting a lot more use. It was around then that I realized I didn’t have any of the classics that I had grown up watching my mom use; so I got on Amazon and bought myself used copies of the Joy of Cooking and the Better Homes and Gardens New Cookbook. I can’t believe it took me so long to have my own copies of these two iconic cookbooks! Inside the cover of the Better Homes book is an inscription “Best Wishes Maggie and Jason From Ed and Helen.” My guess is this was a wedding present that went the same way my carrot cookbook went. Though in this case I am the happy recipient and my kitchen is thrilled to welcome it to the primo spots on the cookbook shelf. I’ve been looking through both of these books a lot lately. My daughter, who’s cooking dinner once a week now, is looking for easy dinners. So the photographs in the Better Homes and Gardens cookbook are great for her to relate to. And I have been pouring through the Joy. What an incredible book! After going through the process of writing my own 100 recipe cookbook, getting to know a culinary tome like this is truly humbling. It was actually not on the cookbook shelf, but on my desk the day that I sat down to write the hypothesis draft for this healthy Chicken a la King recipe. I was trying to remember if Chicken a la King was in fact the dish I remember my mom making with the chicken in creamy sauce served in the little bowls made out of puff pastry. Instead of googling it, I looked in the Joy of Cooking. Not to disappoint, the answer of course was within the pages. It was indeed that very dish I remember. I wonder if my mom had used that recipe! I knew I wanted to make it in my own healthy veggie-heavy way, but to give it that creamy comfort food classic flavor at the same time. I also wanted to make sure it was a simple enough recipe that it would be ready in a half hour for a busy weeknight. What Makes This Chicken a la King Healthier? Normally, I would have started a recipe like this by cutting the raw chicken into cubes, and sautéing it in a skillet to get fond, taking that out of the skillet and adding in the veg, and deglazing. But I knew that staging it like that would A) yuck up my cutting board with raw chicken, and B) take too long. So instead I poached the chicken, and then cut it up after it was cooked through. Meanwhile I made the veggies and sauce, and then stirred the chicken in a the end. It ended up being full of flavor (thank you, sherry—my favorite secret ingredient—and thyme). I only needed a little bit of half and half at the end because the thick sauce has such a velvety flavor, that it really didn’t need much fat to add to the mouth feel. I also skipped right over the fussy/fatty puff pastry business, and opted for pasta instead. According to the Joy of Cooking, almonds should be scattered on top. I am not sure I remember my mom doing that, but I tried it and loved the texture contrast. I think it’s especially nice when served over pasta for that reason. What cookbooks are always on hand? Have you ever gotten rid of old cookbooks? 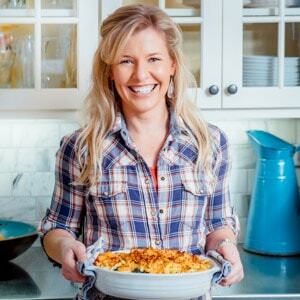 Do you remember certain recipes from the Joy of Cooking or the Better Homes and Gardens New Cookbook? Have you ever had Chicken a la King in the puff pastry shell? 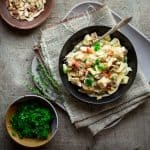 This creamy chicken a la king is a healthy makeover of the classic comfort food dish and is loaded with fresh vegetables and only a splash of half-and-half. 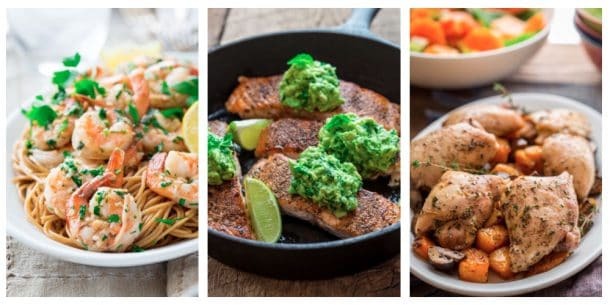 Pasta replaces the fussy puff pastry, so that it comes together in just 30 minutes making it a perfect weeknight meal! Bring a large pot of lightly salted water to a boil over high heat. Cook whole-wheat egg noodles according to package instructions. Drain well and keep hot. Meanwhile, place chicken breast in a medium saucepan and cover completely with cold tap water. Place over high heat and bring to a simmer. Reduce heat to maintain a gentle simmer and cook, turning in the poaching liquid occasionally until the chicken is no longer pink in the center and cooked through, 12 to 16 minutes, depending on thickness of the meat. Remove the chicken and cut into cubes. While pasta and chicken cook, heat butter and oil in a large non-stick skillet over medium-high heat, swirling to melt butter. Add mushrooms, bell pepper, garlic, thyme, salt and pepper and cook, stirring occasionally, until the mushrooms have softened and released their juices, and the juices have evaporated and the vegetables are starting to brown, 8 to 12 minutes. Add sherry to the mushroom mixture and cook, stirring until evaporated. Stir in flour to coat the vegetable mixture. Add broth and cook, stirring constantly until the flour is dissolved into the broth. Bring to a simmer, stirring often. Add chicken and return to a simmer, stirring often until the chicken is heated through and the sauce is thick. Remove from the heat and stir in half and half. Serve the chicken and sauce over the noodles. 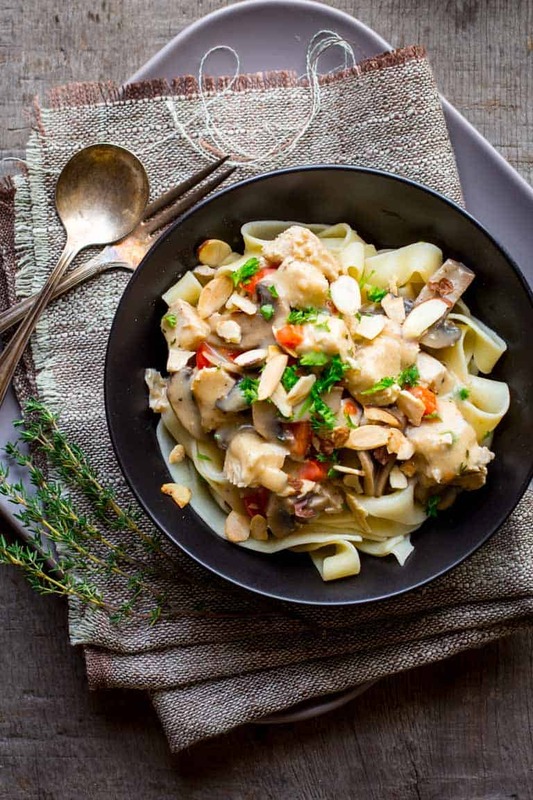 Top with almonds and parsley. Serve hot. Oh wow, this looks amazing! I am loving that sauce! The sauce is the best part!! I totally agree with you. Thank you for coming by Marye. Hope you’re having a great weekend. Oh what as perfect way to eat chicken! This looks so tasty and comforting! Oh, I totally need that one too. Going on Amazon next! And thank you for pinning my friend. Looking forward to seeing everyone next weekend. Wee! I love what you did with this classic! I can so relate to this post Katie, as I just finished packing up my cookbooks for our kitchen reno which is starting in 2 weeks. I still make a variation of the chicken a la king recipe from the Better Homes & Gardens cookbook that I got as a wedding shower gift. The renovation project was difficult to live through, but has made such a difference since it was completed. I am trying to think, and I dont think I got a single cookbook as a gift when we got married. I had to take matters into my own hands. Ha ha. Love the idea of remaking the classics and improving on them! And how great that your daughter is now cooking, too! Lovely meal here! It’s one of my favorite things to do in recipe development. I am on a kick right now with these old fashioned chicken recipes. There are more in the works already. Yes the cooking thing, it is bowling me over how well she’s doing. She is only 10 but acting so mature and responsible about it all. Yum, yum, yum! I love this food! Makes me feel cozy! Thank you my friend. Thinking of you as I am getting ready to go back to Blog Brulee this year. Love this healthy version! So much better than take-out! Thank you Taylor. I hear yah! We don’t do take-out very often here, since we live so far away from any take out places. By the time we get it home it’s usually cold/soggy whatever… not good. Thank goodness for fast (home-cooked) meals instead. I love how you lightened up this favorite from my childhood! Yummy comfort food! this looks absolutely amazing! And I, too, like to cook my chicken before cutting it up because of the yucks….BUT I like to roast my chicken at the beginning of the week for all the recipes I’m planning to make. This is going on the menu next week! I haven’t had Chicken A La King in years. Love this healthier version! Love the healthier version, one of my faves. Hi Justine. So glad you find this recipe tasty too! This is my favorite way to get more veggies into my life. Tossing them with pasta is always the best weeknight dinner and my kids will usually eat it too. That’s a huge win! Hi Karen, I love loading up the veggies in comfort-food. It’s an easy win! This looks so creamy and delicious – I can’t quite believe it only takes 30 minutes to make!! Look forward to trying this! Aren’t 30 minute meals always a revelation! We live by them! My Family to love this creamy and delicious and nutritious recipe. This dish look perfect too. My family always loves anything with creamy sauce and pasta. It’s a clean plate club kind of a meal for sure! My family loves this!!! I make it at least a couple times a month!!! That’s so awesome Jennifer. Thank you for coming back to review and rate. I appreciate it. Have a great rest of your week.